We’d love your help. Let us know what’s wrong with this preview of The Passage at Moose Beach by Michael Foster. Eleven-year-old Alicia encounters unusual, surprising friends and terrifying enemies as she embarks on an unexpected and magical journey in nature. While enjoying the lake with her father, as they do every year, Alicia gets lost during a rainstorm and ends up transported to a different and unfamiliar place with no idea where she is or how she got there. The story takes the Eleven-year-old Alicia encounters unusual, surprising friends and terrifying enemies as she embarks on an unexpected and magical journey in nature. While enjoying the lake with her father, as they do every year, Alicia gets lost during a rainstorm and ends up transported to a different and unfamiliar place with no idea where she is or how she got there. The story takes the reader to a land not so far from home, yet farther than imagined, perhaps another realm, that looks much like what we see around us on earth today, but nothing is what it seems. Alicia sets out on a difficult journey to try and discover a way home, finding compassion and friendship along the way. She meets a squirrel named Mickey, a jay named Briar, and Fiona the enigmatic deer, who help her fight terrible foes and comes face to face with Bristleback, the fearsome mountain troll. These friends help each other in every way imaginable through both moments of adventure and terror. Though Alicia and her friends help each other overcome crippling fear, can they find a way to stop "The Drying" which threatens them all? To ask other readers questions about The Passage at Moose Beach, please sign up. I enjoyed reading “The Passage at Moose Beach” by Michael Foster a magical book for young adults and adults, seniors, kids, anyone who loves a great story. “Did she actually step through a barrier at that small beach, and enter another realm? If she did, it was a place mixed with equal amounts of wonder and terror…"
“One would never guess just by looking at it, but there was magic in this place. 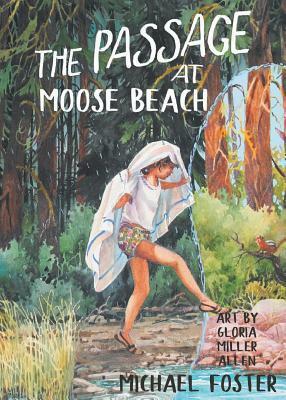 That unassuming patch of sand on an otherwise overgrown lakeshore I enjoyed reading “The Passage at Moose Beach” by Michael Foster a magical book for young adults and adults, seniors, kids, anyone who loves a great story. And so begins an amazing magical heart-warming story of the sixth grader Alicia’s amazing great adventure. Alicia meets very interesting characters with warmth and humor guiding this young girl through the magical land trying to find her way back home. I loved the story and loved the illustrations. This book is a wonderful family read especially for pre-teens, the young teen or young adult. Growing up is never easy but the story makes the reader wonder at it all with wonderful touches of humor, danger, confidence, courage, faithfulness to a friend, understanding, cleverness, sensitivity, compassion for others, mortality, and more - all showing the wonderful imagination of this brilliant author and his desire to educate young growing minds in a very effective way. Some might compare this unique and very entertaining book to other books such as Alice in Wonderland, Wizard of Oz, Dr. Doolittle, or others, but the story is truly unique with a cascade of wonders, emotions and good patterns of behavior especially suited for people growing up. This book is everything you want in a YA/kids book. It's full of adventure, friendship, struggle, and heart. It feels similar to classic kids books like Alice in Wonderland or A Wrinkle in Time thanks to its mix of magical realism and its strong female lead. It's always exciting to read a book where the young girl gets to lead her own adventure. –Charlotte, 7th "I absolutely loved reading the book. It felt familiar, like reading a favorite fable, or following Dorothy on her journey to Oz... it is a girl having the adventure and using her brains." Michael Foster works full time for a major tech company. He is an avid video gamer, a musician, and he loves to host backyard barbecues whenever possible. Writing is a new hobby, and being able to pursue this creative outlet has been a joy. As a child, Michael spent long summers at his family's cabin in Idaho, which was built by his maternal great-grandfather in the late 1920’s, and he would endles Michael Foster works full time for a major tech company. He is an avid video gamer, a musician, and he loves to host backyard barbecues whenever possible. Writing is a new hobby, and being able to pursue this creative outlet has been a joy. As a child, Michael spent long summers at his family's cabin in Idaho, which was built by his maternal great-grandfather in the late 1920’s, and he would endlessly explore the vast Boise National Forest around the cabin and lake. He calls himself a “free-range child” saying that his parents seldom knew where he was during the summer days as his inquisitive nature kept him out and about, always searching the forest for secrets.